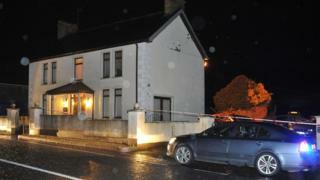 A man found murdered at his home in Glenwherry in County Antrim on Tuesday had been shot in the head, a post mortem examination has revealed. David Murphy, 52, was found dead in the hallway of his house on Church Road. Police believe his murder was carried out some time between Sunday evening and Tuesday morning. They previously described the attack as brutal, and revealed that the shotgun used in the murder had not yet been found. Mr Murphy had previously been jailed for possessing guns and ammunition. Responding to speculation that Mr Murphy's past was linked to his death, Det Ch Supt Jason Murphy said the victim was known to police and that his background would form part of their investigation.